Spaghettoni with Shrimp & Peppers is an easy and elegant pasta dish suitable for any day of the week. A couple of months ago I posted my Lemon Spaghetti with Shrimp recipe and I must say it turned out to be quite popular. Might it have been because of the jumbo shrimp? Maybe it is the ease with which the recipe comes together! Or is it the pretty spaghetti twirl? Whatever the reason may be, it turned out to be my most pinned recipe and shared on Pinterest over 1K+ times!! So thanks for spreading the love! Which now brings me to this dish…Spagattoni with Shrimp & Peppers. This pasta dish is adapted from my very first cookbook, La Cucina di Pasquale, featuring Italian gourmet meals. Pasquale was one of the first celebrity chefs in Canada and an operatic singer known as the singing chef. He would often engage his audience when cooking, with his tenor arias. Red and white wines are staple ingredients in his recipes, as are brandy and vodka. This spaghettoni with shrimp & peppers, features both white wine and brandy but not to worry as alcohol evaporates while cooking. What remains is a wonderful concentration of flavor as the wine and brandy simmer along in the sauce while keeping the shrimp moist. Well…his head shot up, eyebrows rose up to his forehead and he stammered out, “which Remy Martin”? With a smile on his face, he led me by the hand and showed me a less expensive bottle of brandy to cook with. Guess which bottle I still use today…! Seriously though, you can use any type of brandy you like! A favorite quote of Pasquale’s which really resonates with me is “The pasta should not wait for the sauce, the sauce can wait for the pasta.” This makes all the difference in cooking pasta al dente, which is firm to the bite or having mushy overcooked pasta. Spaghettoni are wider and thicker in diameter then spaghetti. They hold up wonderfully and are perfect for this more robust, shrimp and pepper sauce. However any type of spaghetti is just fine as well. Over the years I have made some slight adjustments to the recipe but only to compensate for the extra pasta noodles. I have also made this recipe many times over the years without the shrimp and it turned out just as delicious! Something to keep in mind for those who are not fans of shrimp. Which ever way you make it, enjoy!! Bring a large sauce pot filled with cold water, to boil. Heat the olive oil in a large frying pan and sauté together the garlic, red onion, green and red peppers for about 5 minutes. Stir in the shrimp, tomatoes, basil, chili pepper, salt and pepper and cook for a few minutes. Add in the white wine, brandy and the butter. Stir the sauce and let simmer for about 10 minutes. At this point your water should be at a roaring boil. Add in salt to the water and pasta. Stir well and cook according to package instructions. Drain the spaghettoni and place the pasta on a serving platter. Pour the shrimp sauce over the pasta. Sprinkle with the grated parmesan cheese and chopped parsley. Thanks Lynn! BTW your grand-babies are so cute! Hubby and I are HUGE fans of shrimp. This looks soooo good! Those shrimp are just gloriously pink! They do cook down to a very attractive colour don’t they!!?thank-you? Looks so delicious. 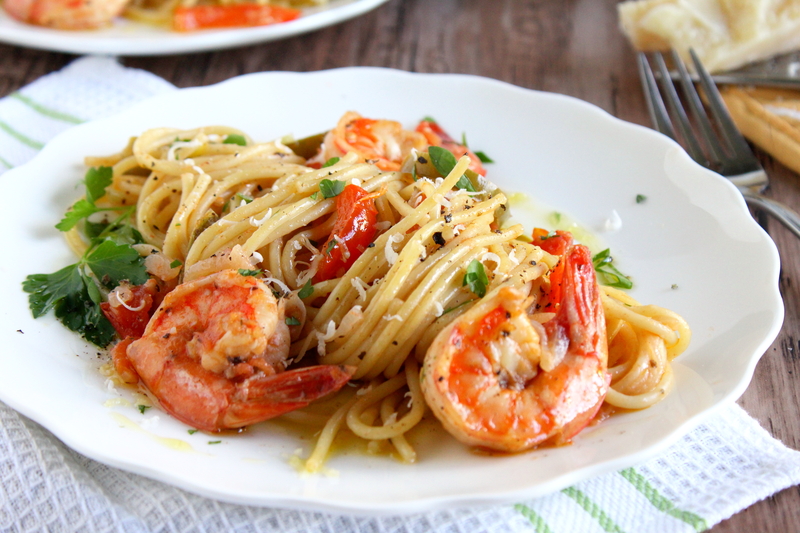 Love shrimp and pasta this dish really is wonderful. Love this!!! and you have photographed the dish so well too!!! Thank-you so much for your lovely comment? Hilarious post Marisa! The pictures here are gorgeous and the dish itself looks incredible. I wish I had more confidence in the pasta department, beyond spaghetti and tomato sauce lol. This looks like something I could do! Renee you whip up the most gorgeous desserts and I have great confidence in you my friend! It will be a breeze for you??? This dish is absolutely beautiful, and it sounds wonderful. Hi Sheryl, it makes a delicious and easy meal to impress guests? thanks!! Love the combination of heartier flavours in this sauce… it’s such a nice change of pace from the lighter, creamier flavours that are more commonly paired with seafood. There’s a bag of big fat tiger shrimp in my freezer that will probably be making their way into this dish very soon. Hi Isabelle, I simply love your sense of humour!! I hope you get to try them….simple and yet so tasty? Thanks so much for dropping by? Beautiful! A perfect summer pasta! A celebration of color, flavor and texture and if that were not enough it is over pasta! Lol…thanks Bella, you always leave the nicest comments? Oh wow!!! Now I’m disappointed I’m not even close to my kitchen . This dish looks so amazing!! I think I’ll have to invite company over this weekend just so I can make this fantastic looking dinner. How wonderful living by the Arabian Sea!! Thanks for re-following, there must be a glitch with WP and others seem to have the same problem. !